I love colorful pillows. Probably because I feel like it adds SO MUCH to my drabby brown couches...actually colorful pillows add so much to any decor! Bedding, couches, a chair or bench. 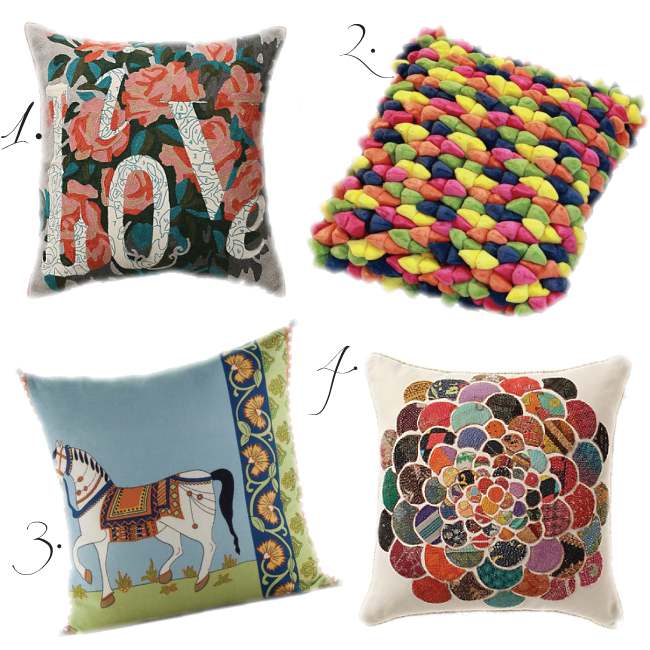 Here are a few that I am lovin' right now...I always keep my eye out for pillows that go on sale (especially at Anthro). I am such a sucker for their throws and pillows, which is where #1 and #4 are from. The second pillow if from Mail Order Rugs...and lastly, #3 is from one of my favorite places to browse (World Market) Oh I could spend hours in that store!